Posted by Michael Reedy on February 8, 2019 in Hockey, Sports, Top Stories. 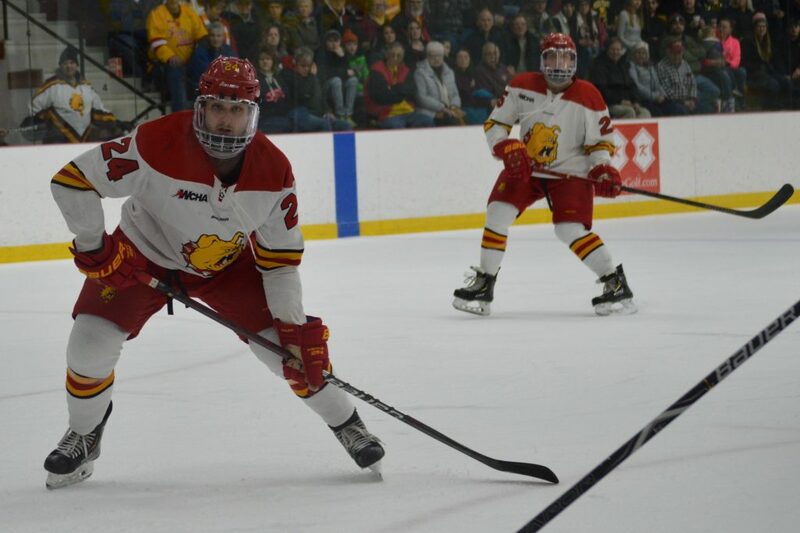 The push for the final playoff spot in the Western Collegiate Hockey Association (WCHA) will be a tight race, and Ferris continues to fight to secure a spot in postseason play. With just eight games remaining in the regular season, Ferris sits at ninth place in the WCHA standings with 13 points, where only the top eight advance to conference playoffs. Above the Bulldogs is the University of Alabama-Huntsville, who have 20 points on the season but have played two games more than Ferris. The point system goes as follows: three points for a win, two points if you win during the three-on-three overtime or shootout, one point if you lose in that overtime situation and zero points for losing. With a conference record of 4-15-1, the Bulldogs will have to get something going during the last portion of the season if they want to play in the postseason. Even though they are down right now, they are still not out for the count. Ferris hockey has not won a playoff game in the past two years, with their last win coming from the 2015-16 season when they made it to the NCAA West Regional Final, where they fell to the University of Denver (Colorado) Pioneers. Ferris has never missed the conference postseason and it is clear that they do not want to end that streak this year. Ferris’ remaining schedule is uncertain concerning their postseason eligibility, as two of the four game series are from teams that are nationally ranked or receiving votes. The Bulldogs dropped a weekend series to Lake Superior State University, with scores of 6-1 Friday, Feb. 1, and 4-2 Saturday, Feb. 2. The other series that will be played are between Bemidji State University (Minnesota), Alabama-Huntsville and University of Alaska-Anchorage, who is currently last in WCHA standings. With the remaining series against teams they’re ghting with for the last playoff spots, Daniels said he anticipates the games to have playoff-like atmospheres. The Bulldogs look to gain more ground in the playoff race at home 7:07 p.m. Friday, Feb. 8, for the first game of the series against Bemidji State.